A Johns Hopkins engineer who is designing cancer-fighting nano-size structures that could assemble themselves and deliver treatment to diseased tissue has received a Faculty Early Career Development (CAREER) Award from the National Science Foundation. 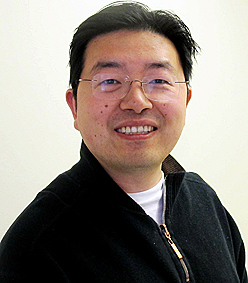 Honggang Cui, an assistant professor in the Department of Chemical and Biomolecular Engineering at Johns Hopkins, has been given this honor, which is accompanied by nearly $500,000 that will be disbursed over five years. The funds will support Cui’s research, which is aimed at producing a more effective and targeted way to provide cancer treatment. To make this process safer and more effective, Cui is trying to eliminate the need for a separate, non-therapeutic carrier. To accomplish this, he is trying to coax the drug molecules themselves to form their own delivery vessels through a process of self-assembly. His team is developing new molecular engineering strategies to put together anti-cancer drugs as supramolecular nanostructures, meaning they consist of more than one molecule. “Such supramolecules could carry a fixed, full dose of the anti-cancer drug within each nanostructure, and this would minimize the potential of toxicity in the carrier itself,” Cui said. Cui completed his bachelor’s and master’s degree studies at Beijing University of Chemical Technology and Tsinghua University in China. He earned his doctoral degree in materials science and engineering from the University of Delaware, and then obtained postdoctoral training at Northwestern University. He joined the faculty of the Whiting School of Engineering at The Johns Hopkins University in August 2010. He is affiliated with the university’s Institute for NanoBioTechnology. The prestigious CAREER award, given to faculty members at the beginning of their academic careers, is one of the NSF’s most competitive awards and emphasizes high-quality research and novel education initiatives. It provides funding so that young investigators have the opportunity to focus more intently on furthering their research careers. Color photo of Honggang Cui available; contact Mary Spiro or Phil Sneiderman.